Why Is ‘The New Republic’ Taking Money From an NSA Contractor to Run Defenses of the NSA? Benjamin Wittes of the Brookings Institution loves the National Security Agency and takes money from Northrop Grumman to blog about it in The New Republic. 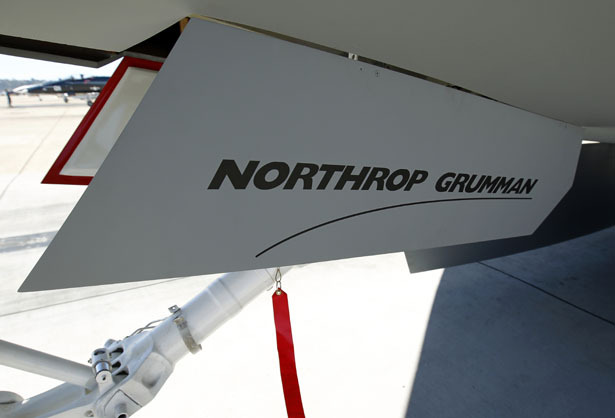 The landing gear on a mockup of a Northrop Grumman X-47B long-range, high endurance unmanned aircraft (Reuters). The National Security Agency has a friend at the Harvard Law School. And at the Brookings Institution. And at The New Republic. And at The Washington Post. Why is Lawfare the NSA’s media portal of choice? Well, consider this. Lawfare, in turn, partners with The New Republic, where this post was republished in its entirety. The joint Lawfare/TNR project is titled “Security States,” and it is sponsored, Wittes proudly notes, by the Northrop Grumman Corporation. Grumman, in turn, is a major NSA contractor—see this $220 million deal it scored with the NSA “to develop an advanced information management and data storage system that will support efforts to modernize the nation’s electronic intelligence and broader signals intelligence capabilities,” a fact TNR does not disclose to its readers. Meanwhile, Wittes’s Lawfare co-blogger Jack Goldsmith, late of George W. Bush’s Pentagon and Justice Department, is a professor at the Harvard Law School, but does not disclose any conflict of interest, as most Harvard Law professors do, for being part of such a project sponsored by a commercial entity. Let’s hear from Professor Goldsmith as to whether he is paid by Northrop for his posts at Lawfare, and whether he thinks he has disclosed that to his Harvard employers, and whether he should make the arrangement public. Let’s hear from The New Republic. Why is it taking money from an NSA contractor to run defenses of the NSA? I’ll be sending this post straightaway to TNR editor Franklin Foer, an old friend. And I’ll e-mail it too Professor Goldsmith, too. I’ll let you know what they say.